Setup inside Terminal 2 at Genève Aéroport, the event village opened its doors at 4pm this afternoon to welcome participants for the second edition of the Geneva 20km by Genève Aéroport. Runners came to collect their bibs and enjoy the activities offered by the event partners in the village. This Sunday, over 2,200 runners will toe the start line for the second edition at 9:30am on the Quai du Mont-Blanc. 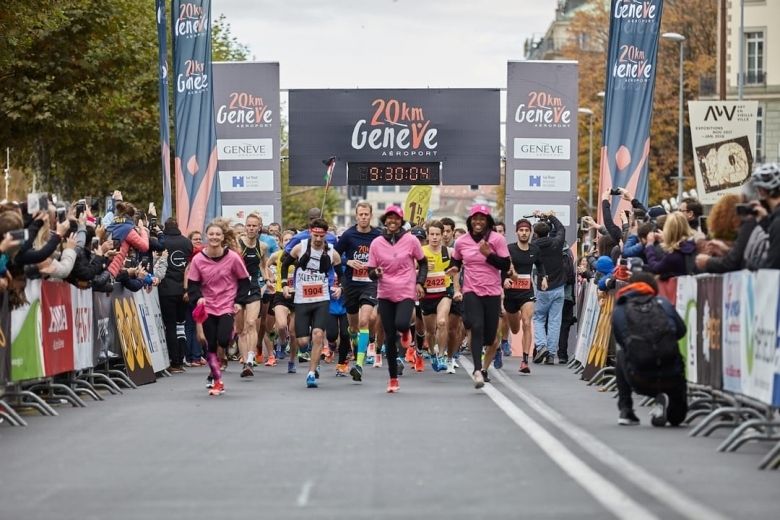 The start will be given by André Schneider, CEO of Genève Aéroport, accompanied by the Lions de Genève basketball team who will wear a pink t-shirt for the occasion to support the Breast Cancer Network, the event’s Official Charity partner. Following the first kilometres along the shores of Lake Geneva, the runners will have the unique opportunity to run through the Palais des Nations, iconic building and a symbol of the international district of Geneva. New also this year, the runners could choose to form a team of three runners to take on the 20km Trio. With distances being even more accessible than the Solo and Duo race formats, the 20km Trio enables everyone, beginners or experienced athletes, to take on this challenge together and spend an enjoyable moment with relatives, friends or colleagues. Friends and colleagues at the same time, Sophie Massobre, Nicolas Equey and Mathis Perrin choose to share this experience: “At the beginning I wanted to run on my own but I convinced them to do it as a Trio”, said Nicolas.